Be the first to share your favorite memory, photo or story of Janet "Jan". This memorial page is dedicated for family, friends and future generations to celebrate the life of their loved one. Billings -Janet "Jan" E. (Campbell) Rothfusz, a long-time resident of the Billings community, passed away Wednesday, the 10th of April at Primrose Group Home. Born in Aberdeen, S.D., Jan is the daughter of Earl and Julia Hardt. She lived with her family in Beebe, SD. The family owned and operated a local mercantile. Jan received a teaching certificate from Northern State Teachers College in Aberdeen, SD. She taught in South Dakota for several years before being hired to teach in Billings, MT. Jan met her first husband, Donald Campbell, while teaching in Billings. Don and Jan married in 1957. To this union, Jan gave birth to five children, four sons and one daughter. Don and Jan later divorced and Jan married Leonard Rothfusz. After the children were raised, Jan went to work for Norwest Bank (aka Wells Fargo). Jan retired when the opportunity to babysit her grandson Andrew presented itself. She was even in the room when he came out of the womb. She proceeded to take special care of Andrew until he started kindergarten and continued to watch him after school until he was in the 3rd grade. She had fond memories of the two playing together in the back yard, going to nearly every park in Billings, frequenting the library often, seeing him in his Halloween costume every year, amongst many other things. Jan was a strong woman, having raised 5 children nearly all on her own. She was not afraid to tell you what was on her mind, she was tough and firm, but she had loving heart and a sense of humor (even if it was dry). She always put her family and friends’ best interests foremost. In many ways, she was a creature of habit, but when she ventured out, she loved to fish, camp, and hunt. 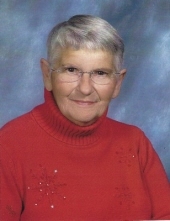 She also enjoyed getting together with friends to play cards and she loved doing the daily jumble in the local paper. She was fond of Neil Diamond and enjoyed going to one of his concerts with her sister, Erla. The two siblings stayed in close contact, sharing many good memories, including a venture to Germany. Jan is preceded in death by her parents, Earl & Julia Hardt; husband, Leonard Rothfusz; daughter, Lisa Campbell and son, Kevin Campbell. She is survived by one sister, Erla (Monte) Turk, sons Ross (Robin) Campbell, Wade Campbell, Jase (Cara) Campbell and three grandchildren (Andrew, Erin & Ryan Campbell) and two step--grandchildren, Elizabeth Spang Cooper and Emily Spang. Services will be held at the Church of Christ, 1220 10th Street West at 1:00 on Monday, April 15th. In lieu of flowers, memorial gifts may be made to Alzheimer’s Association @ www.alz.org/montana. To send flowers or a remembrance gift to the family of Janet "Jan" E. Rothfusz, please visit our Tribute Store. "Email Address" would like to share the life celebration of Janet "Jan" E. Rothfusz. Click on the "link" to go to share a favorite memory or leave a condolence message for the family.